Just as uproariously funny - and terrifically popular - today as when it first began on BBC Radio 4 in 1967, Just a Minute challenges contestants to speak for one minute on a given subject without repetition, hesitation or deviation. Its mix of irreverent fun and ferocious competition has always attracted stellar names from the world of comedy and theatre, all of whom pit their wits - and their wit - against regular players including Kenneth Williams, Derek Nimmo, Clement Freud and Peter Jones. Guests include Paul Merton, Barry Cryer, Libby Purves, Miles Kington and Maureen Lipman. 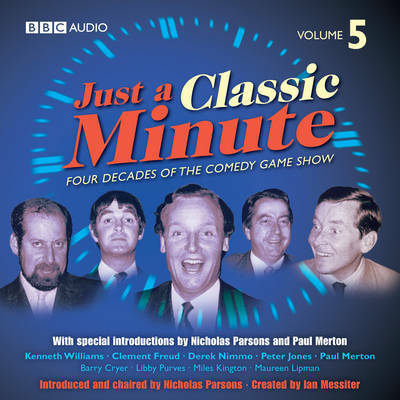 Each episode is preceded by extracts from a fascinating conversation between Nicholas Parsons and Paul Merton, in which they good-humouredly reflect upon the enormous appeal of the game, the various techniques for playing it, the numerous guest players who have take part over the years, and their favourite moments in these particular instalments. 2 CDs. 2 hrs.